Now this awesome video brings back a lot of memories. I owned an Atari 800XL, followed by a 130XE, and the games gradually improved as the software houses improved their programming skills and discovered the true capabilities of the sound and graphics chips. Unfortunately, the title of the games are not listed anywhere on the video, and they're in no particular order of brilliance, but if you've played any of these then you will recognise them quite easily. There are several classic gaming tunes that play in the background which I certainly remember were composed by Rob Hubbard. Personal favourites are International Karate (by System 3), Chop Suey and Elektra Glide. The latter by English Software was a futuristic racing game and featured stunning 3D graphics that really blew me away at the time. 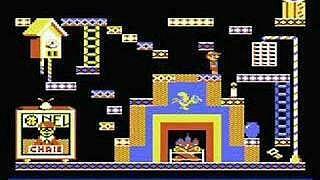 Other favourites include Boulderdash, River Raid, Frogger, Rescue On Fractalus and Blue Max which I spent far too many hours playing! 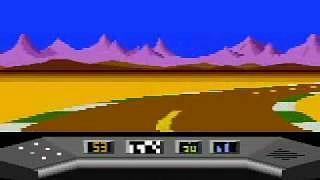 Pole Position was certainly one of my all time favourite racing games, and was my first experience of 3D racing on a home computer. Although graphically dated when compared to later 8-bit racing games, the playability was still far better than most rivals. Overall, this is a fantastic choice of games by the video uploader, and these are game that I grew-up with, and, no doubt, many of you reading this grew-up with, too. I don't know about you, but I've never been able to get quite so excited by playing computer games since the demise of the Atari XL/XE computers. Draconus was a gothic style platform/adventure game which featured stunning graphics, animation and music. The only downside was waiting for the game to load on cassette, which took an age on my 130XE. It would have been nice to have seen a few more titles by Zeppelin Games in the list. They started producing games for the 8-bit Atari's from around 1988, which was quite late into the machine's life, but they released some of the best quality Atari games ever made. Draconus and Zybex were so stunning that it was hard to believe they were being played on an 8-bit computer. Back in the 80s teenagers could program commercial quality games in their own bedrooms. The coder for Henry's House, Chris Murray, was only 16. The game was an imaginative platformer which featured colourful rooms and quirky enemies. It was extremely challenging - too challenging for many - and was a fine example of what a decent platform game should look like. 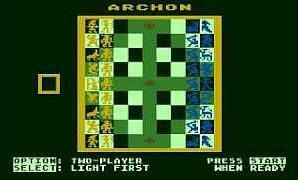 Archon was loosely based on Chess, but proved to be a very original and challenging game - once you got stuck in. Indeed, it was so good that it became one of the most popular games in 1983 and was named the 20th best game of all time by Computer Gaming World. I remember reading a review somewhere (I really can't remember where after all these years!) which suggested that "after playing Archon you would never want to play chess ever again". The game was originally developed and released for the Atari 8-bits before being ported to other machines. Forget all of the newer releases of Ghostbusters, it's the original 1984 8-bit version by Activision that brought real joy to people of a certain age. Okay, so the graphics were rather basic, but, thankfully, the gameplay was pretty enjoyable and I will always remember the excitement of seeing the Stay Puft marshmallow man stomping around. You started the game by building your car which would become ever more extravagant as the game progressed. You were then presented with a map of the city where a flashing building would alert you to where your ghostbusting skills were required. The gameplay involved basically driving around the city and trapping ghosts, but it does become rather manic and challenging as you progress through the game trying to keep up with the ever-increasing number of ghoulies haunting the city - good fun! 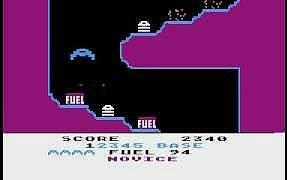 You may have spotted Caverns of Mars in the video, and the game was originally released through a mail order catalogue called the Atari Program Exchange (APX) in 1981. After becoming it's best-seller ever, Atari decided to release the game on cartridge. 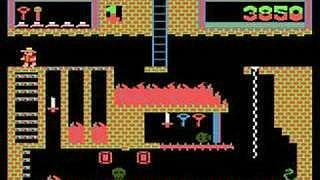 Greg Christensen was still at high school when he created Caverns of Mars on his Atari 800, earning him many thousands of dollars in royalties - rumour would have it that he received close to £100,000. The game is best described as a vertically scrolling shoot-em-up in which you must navigate your spaceship through the tunnels of Mars, avoiding the walls and shooting your enemies and targets such as fuel tanks. 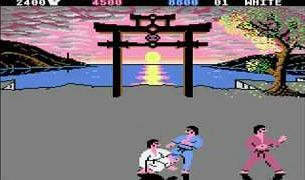 Chop Suey was one of the first in a bunch of martial arts games released in 1986. It was released by English Software on 48k cassette for £8.95 and disk for £12.95. What I particularly liked about this karate game were the nice, big sprites with first rate animations, and also the ability to make quick moves with your joystick. The only annoyance, I remember, was that both players were the same colour which could cause confusion! 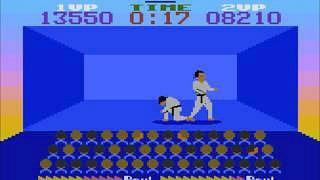 However, it was certainly up there with the best fighter games to come out of the 80s. Montezuma's Revenge was a challenging and well thought-out platformer in which the player took the role of Panama Joe (a.k.a. Pedro), and featured Indiana Jones style challenges with lots of pole sliding (steady! ), climbing ropes, jumping, treasure hunting and avoiding enemies and traps etc. Interestingly, the title of the game refers to contracting diarrhea in Mexico - nice! The game was created by Robert Jaeger when he was just 16, and when Parker Brothers spotted the game at a consumer electronics convention, they bought the rights off him on the spot! Simplyeighties.com is a participant in the Amazon Associate affiliate program. This enables us to earn fees from linking to products at amazon.co.uk.